The databank of natural forests of the Czech Republic represents a data pool with up-to-date available information on the distribution, protection and quality parameters of natural forests in the Czech Republic. The databank is operated and on-line updated by our research team as a service for the Ministry of the Environment of the Czech Republic. 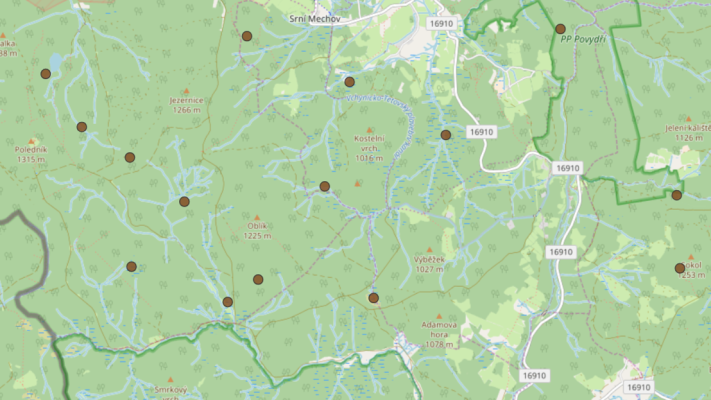 For greater user comfort, the map layers from the databank were interactively connected with map layers of the typological mapping (Forest Management Institute, Brandýs nad Labem - FMI) and thematic layers of the databank of the Nature Conservation Agency of the Czech Republic (NCA). Fundamentals of the databank were already laid in the research project VaV 610/01/99-1.2 (1999-2001) entitled “The analysis of forest ecosystems in the system of existing small-scale particularly protected areas aimed at the system optimization” . The project produced a broad base of the Databank in the form of optimized network of so called forest small-scale protected areas. The actual implementation of the Databank started in a research project VaV 610/6/02 (2002-2004) – “Research and gathering of knowledge on the condition and distribution of natural forests in the Czech Republic” . It resulted in the first nation-wide census (2004-2006) by the respondents, i.e. evaluators of the forest stands naturalness, from administrations of national parks, protected landscape areas, regional offices of NCA and FMI and the divisions of Military Forests of the Czech Republic, s.p. The project continued within the research project VaV SM6/153/05 (2005-2008) “Monitoring of the development dynamics of natural forests left to spontaneous development; preparation of methodology for the selection of areas with communities meant to be left to the effect of mostly natural forces, proposal of methods and procedures for the management of these areas” . It included creating sumary outputs, a web www.page pralesy.cz and making legislative bases for the codification of forest naturalness assessment – first in the Notice No. 60/2008 Coll. and then in the updated version in the Notice No. 64/2001 Coll. Since 2008 the online-system of the Databank has been updated in cooperation with Central Register of Nature Conservation (within NCA). The data about forests naturalness are annually updated from the forest management plans processed in the previous year. This activity was carried out by our team in the years 2008-2011 through mandatory contracts between the Ministry of Environment and VÚKOZ, v.v.i. Since 2012 we have conducted it on our costs. Summary results of the updates are published annually on the page Summary data. Historical influence of forests on the territory of the Czech Republic dates back before the first surviving written records. The first extensive deforestation occurred probably in 8-9th century in the southern and central Moravia during the peak of Moravian Empire. Similarly, with gradual colonization of Bohemia, namely Czech basin delimited by the lower Elbe and Vltava rivers were also extensively deforested. During the Middle Ages, hilly regions and uplands were gradually colonized. Greater need for firewood and new requirements for wood as a material for building and mining lead to a strong devastation of forests and further deforestation in some regions, especially in central Bohemia. This section is intended for those interested in synthetic information about natural forests of the Czech Republic. Summary tables will provide you with information about representation of individual degrees of naturalness of forest stands in several types of territorial units. In 2009, cooperation about biodiversity in natural reserves and forests was launched. This task is provided by colleagues from former department of biodiversity indicators at VUKOZ, v.v.i. More information about this issue is available in the section Localities overview. Report on investigations in 2009 can be found here (in Czech). Report on investigations in 2011 can be found here (in Czech). More detailed research reports for the period 2009-2011 can be found in the section Results from the biodiversity monitoring.